This work looks at the 40 most popular hymns in Britain - as decided in a poll involving viewers of Songs of Praise. The hymns range from communal anthems to personal worship songs. Insight is given into their authors and origins, as well as the part they have played in people's lives. - Publisher Songs of Praise is the world's favourite religious television programme. Its popularity reflects the significance of hymns in the lives of many people. Hymns powerfully express the response of Christians to the love and grace of God. They bring comfort in life's dark days and express shared joys at times of celebration. The book includes the 40 most popular hymns in Britain - as voted by viewers of Songs of Praise in an up-to-date poll. The hymns are a mix of old and new, and range from great communal anthems to personal worship songs. Andrew Barr skilfully weaves insights into their origins and authors with contemporary stories of the part they have played in people's lives. 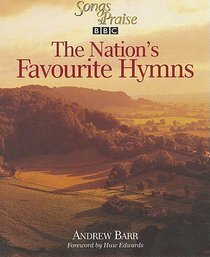 About "The Nation's Favourite Hymns"
Songs of Praise is the world's favourite religious television programme. Its popularity reflects the significance of hymns in the lives of many people. Hymns powerfully express the response of Christians to the love and grace of God. They bring comfort in life's dark days and express shared joys at times of celebration. The book includes the 40 most popular hymns in Britain - as voted by viewers of Songs of Praise in an up-to-date poll. The hymns are a mix of old and new, and range from great communal anthems to personal worship songs. Andrew Barr skilfully weaves insights into their origins and authors with contemporary stories of the part they have played in people's lives. Andrew Barr has worked for the BBC for over 30 years and was involved in many of the editions of Songs of Praise. He is now a freelance writer.